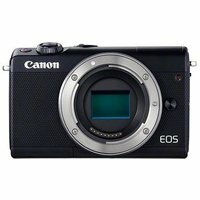 The Canon EOS M100 Digital Camera is a mirrorless digital camera which combines DSLR performance with high portability and sleek looks. Create impressive stills or full HD video with its 24.2-MP CMOS sensor and transfer them easily to your devices or the web via Bluetooth or Wi-Fi. Its interchangeable lens system opens up new worlds of photographic creativity.